Tata has confirmed that they will be launching petrol variants of the Harrier. The petrol engine will be an in-house-developed 1.6-litre unit which will also get an automatic transmission option. But this motor is currently under development and the petrol-powered Harrier can only be expected in India by mid-2020 when the BSVI fuel norms kick in. Apart from this, the Harrier is also in line to get a diesel-automatic option, which is expected to launch later this year. Even the 7-seater Harrier (Buzzard) is expected to arrive in India by late 2019. Tata Harrier is priced from Rs 12.69 lakh to Rs 16.25 lakh, ex-showroom Mumbai.It is powered by Tata’s new Kryotec 2.0-litre turbo-diesel engine. It makes 140PS of max power and 350Nm of peak torque. The engine is mated to a 6-speed manual gearbox which, surprisingly, drives the front wheels. The Harrier is underpinned by the same platform as the Land Rover Discovery Sport. It will be available in four variants: XE, XM, XT and XZ. Dual front airbags along with ABS with EBD and rear parking sensors are offered as standard. ISOFIX child seat mounts, though, are reserved for the range-topping XZ variant along with six airbags, corner stability control, traction control, hill hold assist, hill descent control, rollover mitigation and off-road ABS. There’s no sunroof on offer either. The prices of Harrier diesel variants start at Rs. 12.69 lakh and the top-end diesel is priced at Rs. 16.25 lakh. 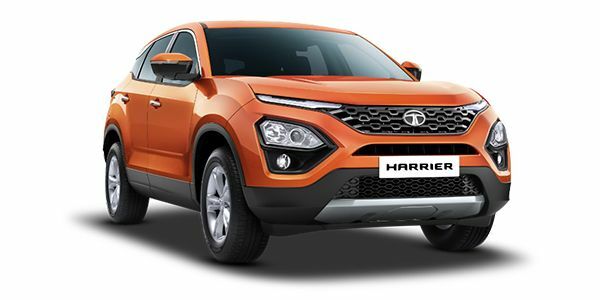 Tata Harrier is available in 4 variants and 5 colours. The claimed ARAI mileage for the Tata Harrier diesel is 17 kmpl. The turning radius of Tata Harrier is 5.75m because of its large wheelbase. Tata has launched the Harrier and priced it from Rs 12.69 lakh to Rs 16.25 lakh, ex-showroom Mumbai. It is powered by Tata’s new Kryotec 2.0-litre turbo-diesel engine. It makes 140PS of max power and 350Nm of peak torque. The engine is mated to a 6-speed manual gearbox which, surprisingly, drives the front wheels. The Harrier is underpinned by the same platform as the Land Rover Discovery Sport. It will be available in four variants: XE, XM, XT and XZ. Dual front airbags along with ABS with EBD and rear parking sensors are offered as standard. ISOFIX child seat mounts, though, are reserved for the range-topping XZ variant along with six airbags, corner stability control, traction control, hill hold assist, hill descent control, rollover mitigation and off-road ABS. There’s no sunroof on offer either. The Tata Harrier is a direct descendant of the stunning Concept H5X we saw at the 2018 Auto Expo. Is the production-spec SUV watered down a bit too much compared to the concept? Not entirely. It does stand out in a crowd, especially finished in bright orange. The headlamps have been moved down to the bumper, whereas the daytime running lamps take their usual spot. Much like the concept, the Harrier too features connected tail lamps. An underwhelming aspect are the 17-inch wheels. We think it looks too sober compared to the rest of the car that commands attention. The Tata Harrier is available with a single 2.0-litre diesel engine. This motor is the same as the Jeep Compass, but with a different engine map. Instead of the Jeep’s 173PS/350Nm, the Harrier gets 140PS and 350Nm. At launch, the Harrier will be offered with a manual transmission only. A diesel-automatic Harrier is in the works and is expected to be launched by Diwali 2019. What’s surprising is that the Harrier is front-wheel drive despite it being based on the Land Rover Discovery Sport’s platform. It does get an ESP-based ‘Terrain Response’ system though, with Normal, Rough Road and Wet modes. This is in addition to the Eco, City and Sport drive modes. You can choose between four variants - XE, XM, XT, and XZ. Even the base-spec Harrier is well equipped with features such as projector headlamps, puddle lamps, dual airbags and ABS. But it’s the XM variant onwards where the Tata is really throwing punches. For instance, the XM packs in a 7-inch touchscreen, steering-mounted audio controls, front fog lamps and drive modes. Highlights on the XT include dual-function LED DRLs, 17-inch alloy wheels, automatic climate control, push-button start, auto headlamps and wipers as well as cruise control. With the XZ, Tata is adding the safety net of side and curtain airbags, ISOFIX child seat mounts and ESP. The XZ is also the only variant to feature the display in the instrument cluster, Terrain Response modes and the larger 8.8-inch touchscreen. Mahindra XUV500: Like most Mahindra vehicles, the XUV offers a lot for the money. Quality is a bit of a hit or a miss, and there are known niggles too. But that doesn’t take away from the fact that Mahindra’s big boy is a well-packaged SUV for those who love munching miles. We don’t see any major deal breakers with the Harrier. It’s loaded, spacious, drives well and is built like a tank. Tata’s best yet? Without a doubt.